Jeni at a booksigning in Maryland for Reflections of a Peacemaker. A Portrait through Heartsongs. Despite having been confronted with unfathomable tribulations, Jeni Stepanek continues to face life with unwavering courage, selfless love, and boundless devotion. 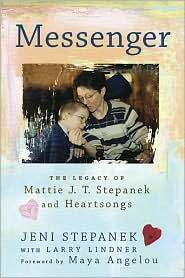 She mothered poet and peacemaker, Mattie Stepanek, with the dedication of a guardian angel – bravely protecting him, nurturing him, guiding his physical, emotional and intellectual path, cultivating his poetic talents, and most of all, being his best friend. Yet, despite her beautiful relationship with Mattie, Jeni’s experience with motherhood has also taken her to the furthest depths of sorrow. She lost 4 children to an extremely rare and life-threatening form of muscular dystrophy, mitochondrial myopathy. She only learned that she was a carrier after being diagnosed with it as an adult, when Mattie was two. Three of her children died in infancy and early childhood-- and yet Mattie defeated the worst of odds. Despite being wheelchair-bound and having to use a respirator the greater part of his life, he fought heroically against the disease and survived until the age of 13 (he passed away in 2004). But Mattie did more than just survive. Thanks to the dedication and guidance of his mother, the inspiration of his heroes and friends, and a dedicated team of medical doctors, he grew to be a world-renowned poet, a national goodwill ambassador for the Muscular Dystrophy Association, and a hero beloved by young and old, worldwide. Rightfully so, he considered his beloved mother one of his own heroes, the person who he said kept his spirit uplifted. Like Mattie, Jeni’s ability to rise above the debilitating disease is awe-inspiring. 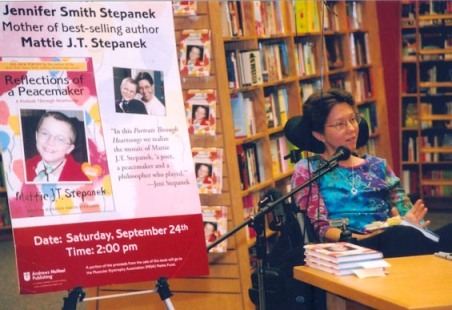 Despite living with MD and using a wheelchair, herself -- during her son Mattie’s life, she steadfastly assisted him with his extensive participation in the MDA, appearing with him at events and television shows including The Oprah Winfrey Show and Larry King Live. In July of 2004 Jeni was elected vice president of the Muscular Dystrophy Association, to serve a one year term in the voluntary leadership role. She is also a faculty research associate at the University of Maryland and a doctoral candidate. Through her work with MDA, her doctoral studies on childhood special education and anticipatory grief, and her writing on children with disabilities and their families, Jeni is well-versed in the subjects that have been the most painful for her throughout her own life. Yet her devotion presses on. Mattie had created five volumes of poems, which he also illustrated by hand himself, in a series he called Heartsongs. The first volume was published in 2002 and soon rose to the top of the "New York Times" best seller list. The other four were published in sequence and each of these also became "Times" best sellers. As Mattie had requested, Jeni compiled and published a collection of his final writings and poems from his journals which she entitled Reflections of a Peacemaker. A Portrait through Heartsongs. Jeni says that she continues in this work to honor the life and talents of her heroic son, to press forward in her mission to help find a cure for Muscular Dystrophy, and to keep spreading Mattie's message of peace, hope, compassion, and the importance of helping one another. Jeni Stepanek has been a devoted mother, a best friend, a well-learned researcher and lecturer, an acclaimed author, a selfless volunteer and ambassador, and above all, a hero who has risen above the greatest of odds. Jeni Stepanek contributed her hero story to MY HERO: Extraordinary People on the Heroes Who Inspire Them. Your purchase of this book helps to support this not for profit educational web project.